More than 400 items on the menu make for adventurous dining at this Hong Kong-style seafood house in a strip center. : One of the true Hong Kong-style eateries in Houston, Fung’s offers a wonderment of fresh seafood. How fresh? Look no further than the wall of aquariums swimming with flounder, ling cod, eels, lobsters and other exotic creatures. Crustaceans, alligator, ostrich, wild game and ingredients like eel milk also populate the menu. For those with less curious palates, we suggest more familiar selections like the crispy egg rolls with shredded duck, shrimp rolled in bacon, garlic-encrusted whole lobster, curried noodles or the delicate dumplings. Dim sum is available daily, but for a more fulfilling experience, go on the weekends when there's a larger roster of choices. Don’t be afraid of the chicken feet with black bean sauce; it’s delicious. A limited beer and wine menu is featured, along with sweets like the baked-and-mashed taro cake. 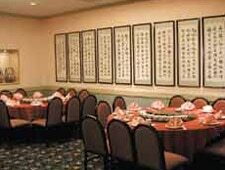 The room is one large banquet-style hall accented with pink and mauve linens and cases filled with Asian artifacts.